That crazy time of the school year, when everything moves at warp speed, and the paperwork seems to multiply every night. I am still trying to read, at least a little. 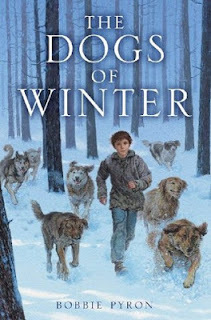 This weekend, I finished Bobbie Pyron's 'THE DOGS OF WINTER. This story is set in Russia, in the late 1990's. The Soviet regime had fallen, typical support agencies had collapsed, and people were living in dire poverty, with little support from the government. Many children (perhaps even two million), lived alone and uncared for on the streets of Russia. THE DOGS OF WINTER is loosely based on the life of one of those children, Ivan Mishukov. Ivan is very young, only about four, when his beloved grandmother dies. His mother becomes involved with an unscrupulous man and then disappears. The man attempts to take Ivan to an orphanage, but the boy escapes, and turns to life on the streets, where he is taken in by a pack of wild dogs. DOGS OF WINTER chronicles Ivan's life with the dogs. A survival story sure to be enjoyed by any dog lover. Jama Rattigan is hosting the poetry smorgasboard over at Alphabet Soup. And me, well, in this age of Common Core, and all things "rigorous," I'm always looking for ways to provide a rich reading menu for students and teachers. My teacher buddies get sick of hearing me remind them about the importance of exposing children to multiple texts. And how many read alouds I think children need to hear every day (a minimum of five, in case you are wondering!). Along those lines, I'm always looking for ways to help teachers infuse more poetry into their classrooms. I recently stumbled across a new book that has lots of possibilities. 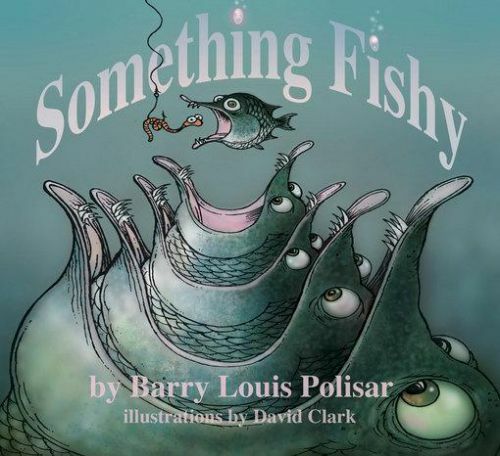 SOMETHING FISHY by Barry Louis Polisar is a collection of ocean-animal-ish related poems. They're short, and rhyme-y, and generally a little funny. I think they'd be a perfect way to open an intermediate, or even middle school science lesson. It could be a perfect pet…"
Yep, I'd definitely use it to open a seventh grade life science lesson on these organisms. I could open a lesson on food chains with "The Smallest Fish." Who's the smallest fish of all? But each fish is another's bait. Similarly, I could use Polisar's "Pot-Bellied Seahorse" or "Horseshoe Crab" or "Jellyfish" in lessons on describing animals or animal reproduction. I can see myself reading these poems aloud, then asking students to choose an animal's unusual features and wrap them into a poem. I could also see myself using SOMETHING FISHY in reading and writing workshops. "The Crocodile and the Gator" would be perfect for opening a lesson on comparative texts. His range is so much greater…"
Polisar's "Killer Whale" or "Baited" would be terrific for opening a lesson on author's message. And if I wanted to talk about satire in a middle school English class, I might open with Polisar's "Another Pied Beauty,"
For dolphin, shark, and whale…"
Look for SOMETHING FISHY. It's a fun new poetry book with lots of possibilities. 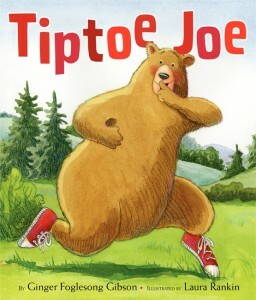 Tiptoe Joe has a secret. He goes from friend to friend- from Donkey to Rabbit to Moose to Turkey to Owl- inviting them to come along and see. I know something you should see." His animal friends thud, and swish, and clomp along behind him, all the way to the end of the book, where Joe's surprise is finally disclosed. I've read this to three groups of kindergartners- all to rave reviews. They loved Joe's tennis shoes ("Just like Pete the Cat!" exclaimed one group). They loved the repeating phrase, which made the book easy for these just-getting-started readers to pick up and read on their own. They loved making the sounds with the onomatopoeia on each page. Put this book in a basket of "everybody reads" in kindergarten or first grade. Or pair it with Kevin Henkes JULIUS, BABY OF THE WORLD or Marla Frazee's BOSS BABY. It would also be a terrific sibling present for a baby shower. A must have for any kindergarten or first grade classroom.